Over recent years, many numerical studies have suggested that the land surface hydrology contributes to atmospheric variability and predictability on a wide range of scales. 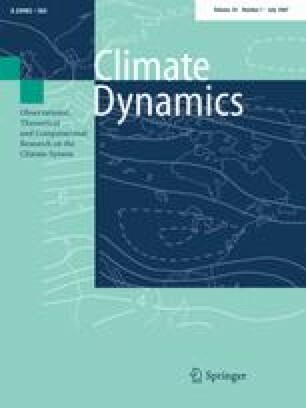 Conversely, land surface models (LSMs) have been also used to study the hydrological impacts of seasonal climate anomalies and of global warming. Validating these models at the global scale is therefore a crucial task, which requires off-line simulations driven by realistic atmospheric fluxes to avoid the systematic biases commonly found in the atmospheric models. The present study is aimed at validating a new land surface hydrology within the ISBA LSM. Global simulations are conducted at a 1° by 1° horizontal resolution using 3-hourly atmospheric forcings provided by the Global Soil Wetness Project. Compared to the original scheme, the new hydrology includes a comprehensive and consistent set of sub-grid parametrizations in order to account for spatial heterogeneities of topography, vegetation, and precipitation within each grid cell. The simulated runoff is converted into river discharge using the total runoff integrating pathways (TRIP) river routing model (RRM), and compared with available monthly observations at 80 gauging stations distributed over the world’s largest river basins. The simulated discharges are also compared with parallel global simulations from five alternative LSMs. Globally, the new sub-grid hydrology performs better than the original ISBA scheme. Nevertheless, the improvement is not so clear in the high-latitude river basins (i.e. Ob, MacKenzie), which can be explained by a too late snow melt in the ISBA model. Over specific basins (i.e. Parana, Niger), the quality of the simulated discharge is also limited by the TRIP RRM, which does not account for the occurrence of seasonal floodplains and for their significant impact on the basin-scale water budget. The authors would like to thank all their colleagues at Météo-France/CNRM that have participated in the development of this study. Thanks are also due to A. Boone for his useful comments on the multi-layer snow scheme as well as to anonymous reviewers for their constructive comments. Finally, we wish to thank P.-E. Decharme for his supports. This work was supported by Météo-France/CNRM and by the ACI “Observation de la Terre” of the French Research Ministry.